Almonds are a delicious, healthy addition to our diets, full of protein, healthy fat and nutrients such as magnesium and vitamin B2. Unfortunately, some people's immune systems mistakenly identify almonds as a dangerous foreign substance and react when even a small bit of almond is introduced into their bodies. This immune system battle can result in bothersome allergy symptoms like sneezing, coughing and itching. A severe reaction, however, can provoke symptoms such as flushed skin; tingling in the palms of the hands, soles of the feet or lips; light-headedness; and tightness in the chest. Left untreated, warns the U.S. Centers for Disease Control and Prevention, the most severe allergic reaction, anaphylaxis, can progress into seizures, cardiac arrhythmia, shock and respiratory distress and is potentially lethal. The brain and heart are the body's rock stars when it comes to survival, but a functioning immune system is just as important. Our immune systems keep us healthy by warning us about dangerous substances that enter our bodies and can make us very sick. Viruses, bacteria and fungus lurk on every surface we touch and even on our own skin. While they cause us little harm on the outside of our body, they can cause major damage if they get access to the inside. When there is a breach in our body's security system and a foreign substance makes its way inside, our immune system recognizes that there is an intruder and heroically fights it off to prevent it from spreading throughout the body and causing illness. Read more: Can You All of a Sudden Be Allergic to Nuts? 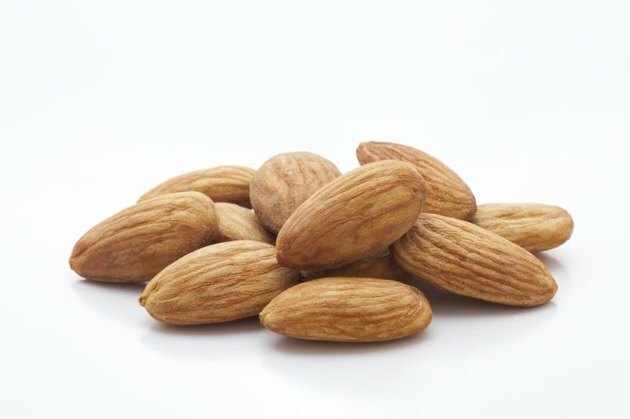 When a person with almond allergy accidentally eats an almond, the body's response is often the immediate eruption of hives – profoundly itchy, raised red patches of skin that blanch white in the center when pressed, according to the American College of Allergy, Asthma & Immunology. Hives, also known as urticaria, can come and go within minutes and can move around to different areas of skin and emerge on any part of the body. Another possibility for people with an almond allergy who eat almonds is an itchy, blistering rash that can occur anywhere on the body. Almonds can worsen eczema for people with the skin condition. Any allergy can be potentially life threatening and should be taken seriously. If you think you might have an allergy to almonds or any other foods or substances, see your doctor right away and be careful to avoid the potential allergen in all its forms. If you have sudden difficulty breathing or mouth, lip or throat swelling after eating something, call 911. American College of Asthma, Allergy, and Immunology: Tree Nut Allergy. Centers for Disease Control and Prevention: Healthy Schools: Food Allergies in Schools.